Against Arsenal, nominal number ten Toni Kroos often dropped deep in build-up. This was done to compensate for the absence of playmaker Bastian Schweinsteiger, but instead created a hole in the last third of the pitch. Today, it wasn’t Schweinsteiger who was missing, but Kroos himself. In his place, Schweinsteiger was playing as No. 10 and dropped back in certain situations. The “hole-problem” wasn’t as bad, but still existed. There were several reasons for that. On the one hand, Schweinsteiger only dropped on certain occasions – many times Xherdan Shaqiri and Arjen Robben got behind and into the half spaces. On the other hand, Shaqiri was given specific tactical orders. Often, the winger made runs into the middle to act as a make-shift No. 10 instead of Schweinsteiger. Sometimes, Robben did the same. This created a very fluid style of play. Furthermore, Martinez and others played many balls through the seams from in-between the lines of the opposing 4-5-1. Schweinsteiger and Shaqiri, being very resistant to pressing, were able to maintain possession or at least draw fouls in this area often. That way, Bayern advanced steadily. The holding midfielders, Luiz Gustavo and Javi Martinez, played very agile too, often exchanging positions in offense as well as in defense and tried to counter the negative effects of Schweinsteiger dropping deep. This created a negative synergy in the last third. 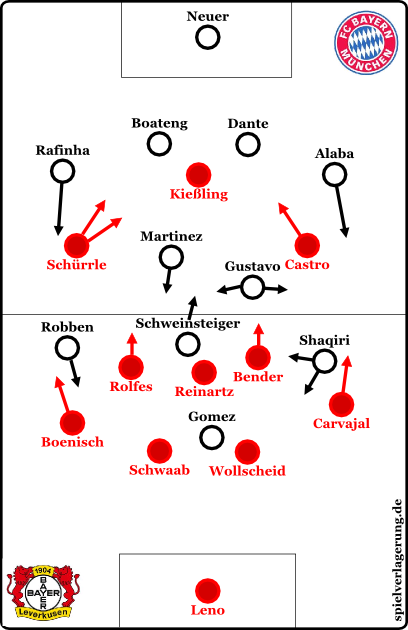 Because Shaqiri and to a lesser extent Robben had to man the middle, they lacked presence in the offensive half spaces. At the same time, the Müller-factor wasn’t there – his diagonal runs behind the defense, which, in the best case, create good chances, but at least increase the space between the lines. This was somewhat lacking from Bayern’s attacking play. In effect, this allowed Leverkusen to show a decent to good defensive performance for the most part. They really only had to cater to dangerous moves from counter attacks from set pieces or lost balls in the build up. Apart from that, they were pretty solid and were able to conjure up some danger themselves. In contrast to the last weeks, where Leverkusen tried to play with more possession and longer spells in the opposing half, they returned to their greatest strengths here. The switched from defense to attack very quick and acted very vertical in their style of play. The deep strikers played close to each other and their early breaks were played as if they were outnumbered. On those occasions, Carvajal and sometimes Boenisch charged forwards too, the later only making his runs later on. The wing backs going forward and sporadic overcharges of the sides were covered for by good counter pressing. Leverkusen was very present on second balls and with their three midfielders, was able to cover space very effectively, thereby becoming dangerous on the attack. In the second half, Sidney Sam was brought on for the unlucky André Schürrle. Now they played higher up the field and forced Bayern back. Bayern wasn’t able to mount many attacks anymore, because of their focus on stability. Long balls to Gomez seemed to become the only mode of relief, apart from that, the constant following up of the midfielders and defenders was missing. In the first half, Bayern were superior, but now, Leverkusen became more and more dominant and got more of the game. In the second half, they played higher up and more present in attack, but weren’t really able to finish their attacks regularly. Again and again, they let themself be pushed from the middle to the half spaces or onto the wings. Furthermore, they had virtually no linked play between the lines. Fittingly, they earned the equalizer came from a set-piece. Leverkusen uses goalkeeper Leno in build up, when needed. Around the 60th minute, Sasha Lewandowski increased the pressure by taking of Stefan Reinartz for Jens Hegeler. Once again, the 4-3-3 in attack became a 4-2-3-1. Thereby, they hoped to use the spaces between the lines to more effect and get higher up the pitch, but apart from slightly higher positioning, there were no positive effects. Advantageous to the higher positions were some interdependencies with their opponent. Bayern seemed weak, they couldn’t get any relief and their pressing got more and more inefficient. The guests played their 4-4-2-pressing again, but with different players. This time, Schweinsteiger and Gomez were the two strikers instead of Kroos and Mandzukic. Their pressing was less intense and less aggressive, which was partly due to the opponent. Under pressure, Leverkusen like to fan out and form a three-man-defense with a holding midfielder tilting sideways in build up. That’s why Bayern attacked the central defenders cautiously, but this was neutralized by Leverkusen well. Leverkusen implemented Bernd Leno into the build up pretty good at times and the holding midfielder presented an option for vertical passes. They couldn’t use many long balls, because they were mostly cleared by Boateng and Dante. Especially Dante showed a strong performance once again and passes the ball very good. The midfield started great too, but they got weaker as the game went on. Schweinsteiger dropped deep defensively on occasion to help out Martinez and Gustavo. 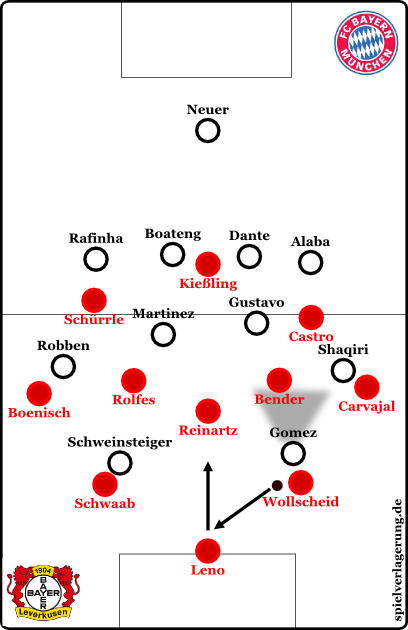 One of Gustavo and Schweinsteiger often got on the wings to support the indenting wingers in pressing. Especially Gustavo acted very horizontal, got into many duels and attacked far to the sides often. This meant positional changes between Gustavo and Martinez, which they played out cleanly, not opening up any gaps. Both teams didn’t show their best performances, only being able to convince in certain zones and phases. Almost accordingly, both only had two shots on goal in 90 minutes. Over the whole match, Bayern has to be considered the slightly superior team, but nevertheless have to feel lucky about their win. In the closing stages of the game, their winning didn’t seem entirely probable. Causes were, besides the generally phlegmatic style of play and the defensively solid opponent, Heynckes substitutions. In itself, the formation and changes weren’t a problem and understandable when looking at the whole picture. One rotated on a few positions, made defensive substitutions and took care of stability. But the focus for the substitutions was more on giving players playing time, instead of effective tactical changes. Pizarro coming on was for example, in spite of his technique, the wrong choice in order to create more danger from counter attacks. Shifting Rafinha to the right wing with Boateng in behind seemed a bit weird, especially as van Buyten should have had enough playing time already. At Leverkusen, Sam stood out, proving resistant to pressing, and the collective behavior when Bayern was keeping the ball was outstanding too. In spite of Bayern’s individual class, which inevitably granted them a few good scenes, Leverkusen were able to block shots in time, create pressure or close up spaces. Nevertheless, it wasn’t a great game, even though it offered some tactically and technically interesting elements.